The Community Democracy Project is pushing a radical ballot initiative in Oakland that would give citizens the power to decide how to spend taxpayer funds. Kit Decker (left) and Shawn McDougal of CDP. 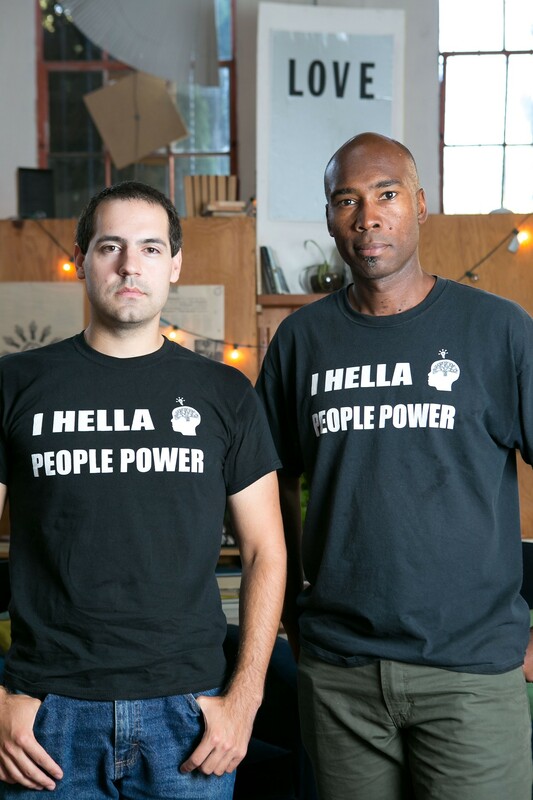 A group of Oakland residents are campaigning to radically transform the city's budgeting process — transferring power from City Hall to one hundred newly established Neighborhood Assemblies throughout the city. At farmers' markets, civic events, protests, and heavily trafficked areas, volunteers with the Community Democracy Project (CDP) have been collecting signatures to bring a "People's Budget" to the ballot. The initiative would amend the Oakland City Charter to allow citizens to decide how the city spends taxpayer funds — a process known as participatory budgeting. If the initiative gets the 32,000 verified signatures necessary, and if voters approve it next year, the results would be unprecedented. To date, some cities have designated parts of their budgets to participatory budgeting. Vallejo has set aside nearly $2.5 million for it, and residents in 24 of the 51 council districts in New York City vote to allocate $25 million in discretionary funds. As of this year, Paris, France has the largest participatory budget, after it allocated 20 million Euros in 2014, and then committed an additional 426 million Euros through 2020. But there is no city of significant size that has created a participatory budget for 100 percent of general city funds as CDP's initiative seeks in Oakland. "It's a big change, but the great thing about our initiative is that it provides a lot of the infrastructure to make it happen," said Allee Rosenmayer, a co-director of CDP. "We're not just pushing this radical change to the city charter through then leaving others to figure it out." While the idea of a people's budget is simple enough, the infrastructure would be complex and multifaceted. The initiative would establish a new city department, one hundred Neighborhood Assemblies, a Congress of Directors, and a few dozen citywide committees. It would also establish two citywide votes, one on the allocation of funds by city department, followed by decisions on how on to spend funds within specific departments. In essence, the new participatory budgeting process would replace what the Oakland City Council does currently. The mayor would still propose a budget, but instead of winning over city councilmembers, he or she would have to go to the Neighborhood Assemblies. Organizers with the CDP believe that taking the power from the council is necessary to create a more transparent government that better responds to the priorities of Oakland residents. They see the initiative as creating a fully transparent process that would leave no room for backdoor dealing. There's also the belief that giving people more responsibility in governing will create greater civil awareness and engagement. There's no one specific budgetary item or decision that's the impetus for initiative — at the base is the belief that taking power from elected officials and bureaucrats and giving it to people will naturally lead to better outcomes. "We go into other communities where instantly people are like, 'Yes! Oh my god! This is what I need, this is what Oakland needs!'" Rosenmayer said. "Because communities feel City Hall is not listening to their needs, a lot of people feel disempowered." Cities that have adopted participatory budgeting have seen a shift in funding priorities to underserved communities, said Brian Wampler, a professor of political science at Boise State University in Idaho and a Fulbright Scholar who studied participatory budgeting in Brazil. "A model is that those who are typically marginalized and from poorer areas would received more funding with participatory budgets," he continued. The Neighborhood Assemblies are the backbone of CDP's initiative. Current Neighborhood Crime Prevention Council districts would be used as a template, then cut in half so that each Neighborhood Assembly would include 2,500 to 5,000 residents. Residents of each assembly district would then vote for three to five volunteer directors who would facilitate monthly meetings. During the first step, Neighborhood Assemblies would provide residents with a breakdown of the current budget — what percentage of funds go where. Next, over the course of a year, the assemblies would analyze the budget and interest groups would be able to advocate for their funding priorities. Finally, residents who had attended at least one meeting would choose what percentage of the total budget would go to which department. The choices would then be averaged out to create a proposed general fund budget. There would then be a citywide vote on that proposal. "I don't expect there to be radical changes. It's the law of large numbers, on any given issue you have people who are extreme, but most people fall somewhere in the middle," said Shawn McDougal, a CDP co-director. "If you get thousands of people citywide going to these Neighborhood Assemblies getting to decide, then things are going to average out." In the second year, the assemblies would propose how to spend funds within each department. When an assembly passes a proposal, it would then go to a citywide committee. The citywide committee would put together the proposals from all of the neighborhood assemblies to create a spending package. The city would also create a spending plan. Voters would then choose which package would take effect. The initiative would also create a new city department — the Democratic Budgeting Program — that would have an operating budget of $4.1 million annually for the first five years and then would be subject to the participatory budgeting process of all other city departments. "I think it's very complex and very ambitious," said Oakland attorney and 2014 mayoral candidate Dan Siegel. "It has the possibility of really shaking up how the city functions — and that's a good idea." This isn't the first time the CDP has attempted to bring a people's budget to Oakland. In 2013, volunteers collected signatures for a similar initiative, but disbanded the campaign after it became clear that they would not collect enough signatures by the deadline. In the two years since, organizers with CDP attempted to grow their base and recruit more volunteers. Rosenmayer said CDP needs 100-person hours of canvassing for signatures to reach the goal of 40,000 by mid October. In 1989, Porto Alegre, Brazil became the first city to launch a participatory budgeting program. Since then, more than 120 of Brazil's largest 250 cities have established participatory budgeting. All told, more than 1,500 municipalities across the world have brought budgetary decision-making to their residents, according to Participatory Budgeting Project, a New York City-based nonprofit with an office in Oakland. But for most cities, residents only vote for social programming and new capital investments — not the entire budget. "A participatory budget in Oakland would be a big step forward in the US," Wampler said. So will it succeed in Oakland? In most cases, participatory budgeting has enjoyed the support of a mayor or other elected officials before being established. Wampler said that he has yet to see it successfully implemented without strong institutional support. "You need a mayor who is a reformer, forward-thinking, and ready to try something completely different," he said. Mayor Libby Schaaf has yet to take a position on the initiative, but a spokesperson touted her authorship of the Budget Adoption Transparency and Public Participation Policy as a councilmember and her participation in Community Budget Forums as mayor. "For me, the most important thing is not the specific outcome, but the process of civic engagement," McDougal said, "of people realizing that democracy is a participatory active process, rather than just voting every four years and then go home and watch it on TV." Berkeley attorney Tia Katrina Taruc Canlas is holding batterers financially accountable in court for their actions.